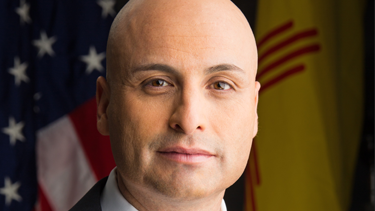 New Mexico Attorney General Hector Balderas (Class of 2001) and four other former students who were either low-income and/or first in their family to attend college were recently honored for remarkable contributions to their professions. Awarded by the Council for Opportunity in Education, the 2017 National TRIO Achievers is named for the federal TRIO college access and support programs that have been helping low-income, first-generation students and students with disabilities succeed in college against all odds for more than 50 years. I was raised by a single mother in the rural village of Wagon Mound, New Mexico. Growing up on food stamps in public housing, I learned the importance of compassion and respect. I also developed a deep conviction that everyone deserves the same opportunities to succeed, regardless of background. Growing up in a forgotten community, I experienced firsthand the dearth of opportunity and the lack of support for children and families who live in these areas. The importance of school and believing in yourself are difficult to communicate in an environment that is neglected, where examples of achievement simply do not exist. This paradigm has to change, and programs like TRIO are so vital in creating that shift. While I grew up in a forgotten community, I became the exception to the rule. Because of the TRIO programs, I went on to earn degrees from New Mexico Highlands University and the University of New Mexico School of Law—becoming the first person from my hometown to become an attorney. I would not have accomplished these things without the mentorship and guidance of the TRIO programs. Attorneys General are not supposed to come from Wagon Mound, New Mexico. Yet here I am, and I can directly attribute that to you. The TRIO programs gave me the building blocks to eventually realize that my struggles, and where I am from, are ultimately my strongest attributes. I am eternally grateful for the opportunity that the TRIO programs gave to me, and every day I serve the people of New Mexico with the lasting impression of their impact. My single goal is to make our communities safer and more prosperous so that kids can grow up and realize their potential. To that end, I can confidently say that I carry the values your program instilled in me every day.